Dehydrated insect eyes are ugly. You might think it's too late at this point to photograph them, however there are actually options for rehydrating insects. The chemistry involved revolves around wetting agents and their use. Rehydration of Chrysidinae eyes (Chrysura radians?) with Decon90 - before and after a warm 2 hr soak. 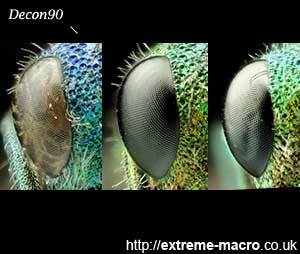 The restoration of the Jewel Wasp eye is excellent but attention must be drawn to the change in colours. What I don't know is if the colour change is colour restoration back to the original as it had when it was alive, or colour degradation. This incredibly dirty specimen was found on a windowsill and had been there for some time, prior to being kept frozen for 30 months. I then thawed it, cleaned it three times in an ultrasonic cleaner with Decon90, was surprised at how well the eyes were restored, let it dry for 4 days to dry out the eyes again, and did this test. I have not tested yet how well it will fare on a completely dehydrated specimen. Water is what is called a polar molecule. If you could see one it would look like a "V" with an oxygen atom at the point of the V and a hydrogen atom at the end of each arm. Because oxygen and hydrogen atoms have different electrical natures the molecule as a whole isn't electrically symmetric: the oxygen end has a slightly negative charge and the two hydrogen ends have a slightly positive charge. This makes it behave like a magnet: attracting other polar molecules with opposite charges. So the - Hydrogen end of one water molecule sticks to the + Oxygen end of the next one, and so on. This is also what creates the surface tension force that pulls water droplets into spheres. Ie a +- attracts a +- attracts a +- and so on. Decon 90 - before, after 2 hours and after an overnight 12 hr soak. The 12 hour soak seemed to slightly indent the eye. However, decomposed organic matter (ie insect specimens) are not +- charged like our friends the water molecules. When organic matter decomposes there is an organic nonpolar coat that adheres to the decomposed organic matter. And because it is nonpolar, water has a problem sticking to it. In other words, the particle will repel water, though in fact it's more accurate to say that it simply doesn't attract it. Wetting agents, or surfactants, are molecules with one end that is attracted to water and the other that's attracted to nonpolar molecules like those in decomposed organic matter. They act like glue that holds two surfaces together that would otherwise repel each other. Dishwater liquid is an everyday example of a wetting agent in use. With all the food oils and such on the plate, the cohesive forces inside the food, and between food and plate make it difficult for the water to spread and clean the plate. The dishwater liquid, a wetting agent, gets into these bonds between the food and the plate, and weakens them enough so that they come off the plate, dissolve, and your plate becomes clean. Decon 90, more commonly used for radioactive decontamination. Decon 90 is a milky white, non-viscous emulsion of anionic and non-ionic surface active agents, stabilising agents, non-phosphate detergent builders, alkalis and sequestering agents, in an aqueous base. Decon90's primary use is as a surface active cleaning agent and radioactive de contaminant for laboratory, medical and industrial applications. Decon 90 is not a consumer product, it will scar and eat through a varnished wooden surface and it is not suitable for use on non-ferrous metals, notably aluminium and zinc, or on polycarbonate. That said, Decon90 has quite the double identity, and is also used by natural history museums to restore organic specimens that have been preserved in alcohol and lost their colour and plumpness. Decon90 is a strong alkaline substance and immersing a specimen in 100% Decon90 will dissolve internal musculature within 24-28 hrs, as I discovered with the grasshopper specimen that I used the first time I tried it. However, diluted it works well for restoring insect eyes: the photograph of a metallic wasp above was immersed in a 20% concentration in water and the eyes were restored after only two hours. It is important to note that the solution was only heated to 40-50 degrees F, ie warmed not hot. The main ingredient of Decon90 appears to be KOH (Potassium hydroxide), and it transpires that this can easily be purchased in pellet form. It maybe worth investigating if KOH on its own performs as well as Decon90, as this would considerably lessen the delivery cost for purchasers overseas from the UK, where Decon90 is shipped from. Leaving a Leaving a specimen in too hot or too strong Decon90 for too long can have the opposite effect to what's intended specimen in too hot or too strong Decon90 for too long can have the opposite effect to what's intended. The same insect illustrated above was left overnight in the 20% solution and the specimen photographed in the morning. The left eye had started to cave in as illustrated so caution should be observed. It turns out that KOH is the main component of Decon90, and this degradation is due to a process commonly referred to as chemical cremation or resomation. Potassium hydroxide hastens the decomposition of soft tissues, both animal and human, to leave behind only the bones and other hard tissues - entomologists wishing to study the fine structure of insect anatomy may use a 10% aqueous solution of KOH to apply this process. Household ammonia (25%) diluted with water to obtain a 10% ammonia solution can be carefully applied to insect parts under a stereo microscope to give a good recovery although discolouration and degradation may occur. Agepon is ironically a photography substance: a photography wetting agent concentrate which was used to cut the drying time of photography paper. Trisodium phosphate (TSP) is an inorganic compound used as cleaning agent, lubricant, food additive, stain remover and degreaser. The major use for trisodium phosphate is in cleaning agents. The pH of a 1% solution is 12, and the solution is sufficiently alkaline to saponify grease and oils (saponify: convert fat into soap). In combination with surfactants, TSP is an excellent agent for cleaning everything from laundry to concrete driveways. Good insect restoration results have been reported with this mix, better than Decon 90 albeit with a higher discard rate after treatment due to deterioration. TSP is sold in powder form on eBay and is easily sourced. Mix it into distilled water (bought at a supermarket) and use any one of several photography wetting agents (they all more or less do the same thing, but do your research first). Hi Johan, Excellent tips. What is the final procedure after soaking the specimen in Decon 90? Do you rinse it with water to remove residual detergent and then on isopropanol to dry? I love the site, by the way. I have so much to learn and you seem to have covered most of it here. Wait. Do you mean 40-50 degrees F or 40-50 degrees C? ("Decon 90" section, 2nd paragraph, last sentence.) 50 degrees F is not warm! Can/Should this be used with sonication? Yes, I do mean degrees F - warm as opposed to hot the touch. I don't use it with a sonic cleaner myself. Johan, does leaving the insect in 20% Decon90 for ~2 hours relax them as well? I have some new specimens and would like to clean and mount them. Should I relax them, pose them, dry them, then use Decon90 and dry again?